Please call us for the rates for 2019! Upon arrival Iguazu, meet & greet by our representative and transfer to hotel for check in. Then transfer to Iguazu for Helicopter Tour. This exciting and informative tour travels over the water falls by helicopter with flights lasting about ten minutes. 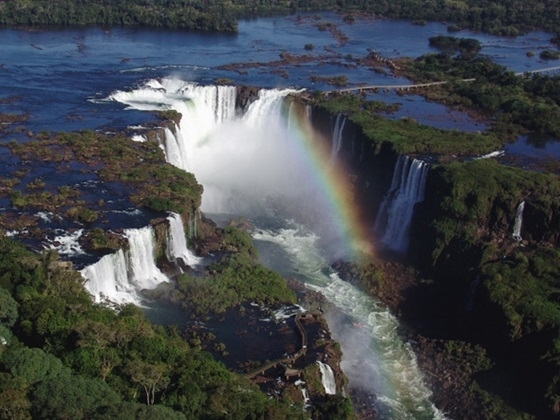 The flight offers the unique opportunity to observe the picturesque landscapes and scenery of the Iguaçu National Park, Três Fronteiras (the meeting point of the borders between Argentina, Brazil and Paraguay) and the Itaipu Dam and reservoir. Duration: approximately 10 minutes. Breakfast at hotel/ Guided hikes of the Superior and Inferior Circuits, and of Devil's Throat/ In the afternoon we will continue our tour to Brazilian side of the Falls. Breakfast at hotel. Free time for last optional excursions. Transfer out to the airport for next destination. 2 nights accommodation at your chosen hotel with daily breakfast. HD Macuco Safari Boat Ride USD78 Macuco Safari docks on the Brazilian side of the Iguassu River. In the water, inflatable bi-motor boats, constructed to withstand the rigors of the excursion, are secure and efficient vessels. Before embarking, passengers receive life-vests and plastic containers in which to protect photographic and filming equipment. The boat travels up-river passing the canyon facing the rapids at a speed that permits the appreciation of the scenery. Rocks, animals and a lot of greenery complete the scenery until the base of the Falls is reached, next to the "great horseshoe" know as the "Devil's Throat". To top the tour off, the pilot will give everyone a splash by navigating through the spray of one of the falls! We recommend that passengers bring a change of clothes, due to the constant spray from the falls, and don't bring anything that cannot get wet - lockers are available at the pier before boarding.